I do not know what I cannot do. Some tiny rodents spent a great deal of time building a tiny stick structure inside my cave. Did you know you were allowed to do that? I did not. The thought of doing so had certainly crossed my mind before. I had, on numerous occasions, considered building tiny structures within my cave (which is, itself, a kind of structure). I figured it was not allowed, though. Who would let such strange things happen with absolutely no consequences at all? Certainly, there had to be some rules on this matter. It turns out there are no rules on this matter. Or any matter, that is. Not in the forest, anyway. 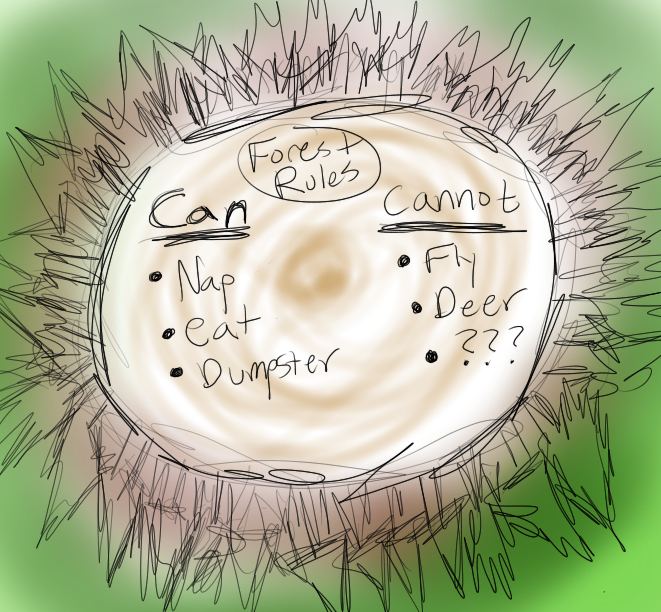 After I accidentally slept on the rodents’ tiny structure (again, not against the rules but I am sure someone (probably the rodents) frown upon it), I decided I needed to try to understand the do’s and don’ts of the forest. After all, what if I was breaking forest rules, upsetting whoever created those rules (likely trees but a council of raccoons definitely seemed plausible as well). I went exploring for answers. I had no idea where to begin, so I just started doing what I like to do when I do not understand something: ask local squirrels and just sort of shout out my questions until someone or something answers them or I get sleepy and nap wherever I am standing. My search was mostly fruitless. Rob (the squirrel) (from whom I often seek perspective on various subjects because he thinks so differently compared to most things that think) said that there were no rules anywhere, that the word was meaningless, and that I should do whatever I please all the time until I die because that is all there is. Then he bit me and ran. I suppose it would be nice to do anything I wanted forever and always, but I did not like Rob (the squirrel) biting me, and it would have been nice had there been a rule against that. This was a complicated matter. What can you do in the forest? What can you not do in the forest? Who decided such things? Did I get any input on these decisions? I still do not have the answers. I do my best to do what I think bears can do (eat grass, nap, stare at things, etc.) while trying to avoid what I think bears probably cannot do (get along with deer, fly, not nap, etc.). It is intimidating to think I have to be my own rules compass, but if the forest cannot provide a set of rules for me and other creatures to follow, what am I to do? Honestly, I just hope I am doing it right. This entry was posted in Bear thoughts and tagged bear blogs, bears, nature, nothing matters, rules, that is not nice, the forest, thoughts, we are all going to die on December 14, 2015 by A bear. Perhaps the answers your are searching for are in the wind and the trees. You are a bear.